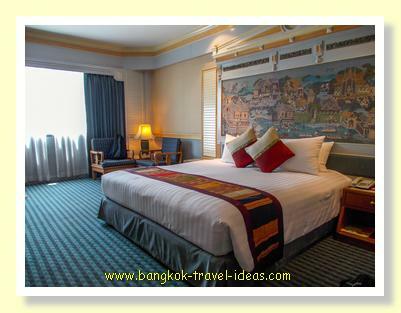 The check-in process at the Ramada Plaza Menam Riverside was very efficient and we were shown to our room overlooking the Chao Phraya River. The hotel room looked like it had been recently redecorated and re-carpeted, so it was in good condition and it really did look nice. 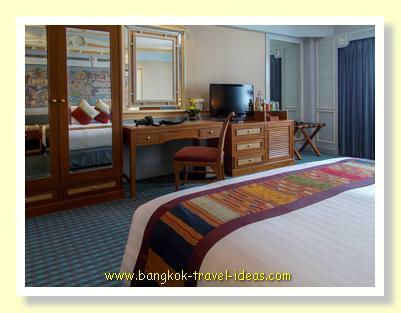 There was plenty of space to put everything and there was a nice view overlooking the Chao Phraya River. As far as I could see none of the hotel rooms had balconies, but all the rooms on this side of the hotel have great river views. I could see a storm brewing in the distance as I looked out of the window. It didn't look like it was coming in our direction. 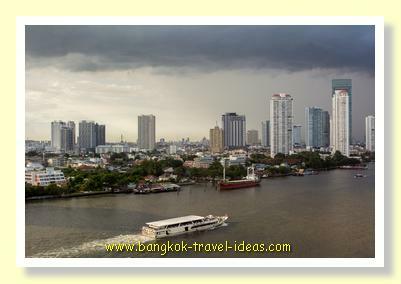 Around this time of year Bangkok experiences its rainy season and whilst most days are overcast and dry there is always the chance of an afternoon thunderstorm. Usually these are quite brief, but they can last a couple of hours. After a quick unpack and tidy up we walked out to get some lunch. Turning right as we left the hotel we grabbed some food at a little noodle shop just over the road; nothing too fancy but it was time to eat something. After eating we wandered over the road and down a small soi to look at Wat Ratcha Singkorn. We couldn't go into the temple as it seemed there was a funeral in progress but we had a wander around the buildings and grounds. Wat Ratcha Singkorn is just a small temple and has an associated school attached to it, which is quite common for Thailand. The Ferris wheel from Asiatique is visible over the roof line of the temple. The Ramada Plaza Menam Riverside is really that close. It was still around lunch time as we passed the playground of the small school and all the children were still out playing. Buddhist temples in Bangkok are always good for photography because of the architectural style and the colours of the buildings. 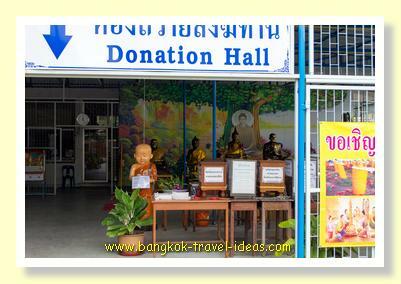 This Bangkok temple is fairly small, but we saw that they had a place to donate money to provide coffins for people whose bodies are unclaimed or cannot afford a coffin themselves. Inside the building they had lots of basic coffins; sort of makes you think where we all end up when you see something like this. 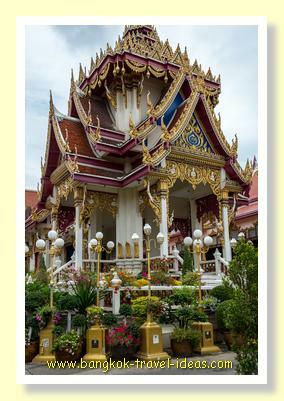 I have previously written before about the coffin temple at Wat Hua Lamphong. We walked a little further down the soi to the ferry wharf on the Chao Phraya River to look around. It turned out that this ferry pier is the terminus for the orange flag ferry that goes all the way to Nonthaburi. Checking on the route map outside the Temple I could see that a trip up to Nonthaburi was going to cost all of 15 Baht each. After a quick discussion it was agreed that tomorrow we should come back and take the ferry and head on up to Nonthaburi. 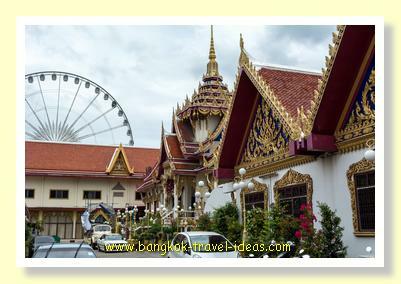 The Ramada Plaza Menam Riverside is located about 500 metres from one of Bangkok’s newest tourist attractions; Asiatique the Riverfront or more commonly known as just Asiatique. Walking back past the temple and turning right we continued along the road until we reached the start of the Asiatique grounds. It was early afternoon and there were practically no people around, other than the security guards. Even though July is the start of the rainy season the weather was fine, but the sky was overcast and so far on my trip there had been a few spotting showers, but no persistent rain. Down by the river, we sat a while on some shaded seating looking at the tugs pulling the long barges full of cargo down to the port. Some of the barges were returning empty and were very high in the water. I have only seen laden barges previously so it was interesting to see how much of the barge is actually underwater when they come past fully laden. Right in front of us were moored the two free ferries that collect passengers from the Saphan Taksin pier. 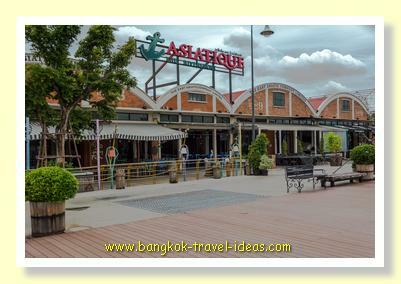 The last time we visited Asiatique this was how we had arrived; although not on either of those two boats, because the boat that arrived was quickly filled, so we took another boat for a small cost. 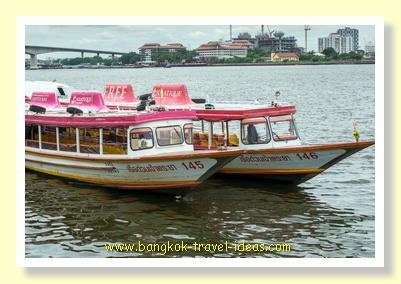 Getting the BTS to the Saphan Taksin stop is a convenient way for many tourists to get to Asiatique and having the free shuttle boats is an easy way to make the last leg of the journey. None of the stalls were open yet as Asiatique opens at 5:00pm; even the Ferris wheel was stationary. The place had an eerie lonely feel to it without the bustle of tourists. In a few hours the stalls and restaurants would come alive I thought. After enjoying the warm breeze by the river and taking a few photographs we then set off back to the hotel and sat around the pool for the afternoon. We will come back to Asiatique tonight. The pool in the Ramada Plaza Menam Riverside is nestled between the two wings of the hotel and although it is sheltered it does get a fair deal of breeze and so doesn't get too hot. 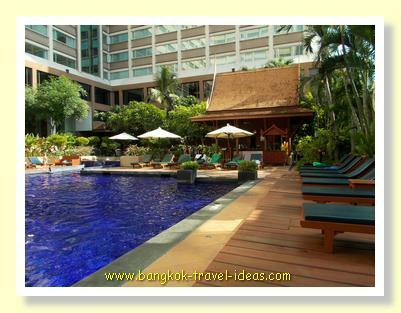 There is also a choice of the sunny side or shady side, so this is a hotel swimming pool that will suit everyone. Most people tend to come down for a swim in the late afternoon to avoid the heat of the day and today was no different. 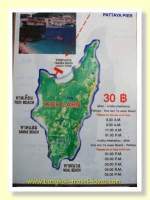 As we arrived early it was pretty quiet, but by 4:00 pm nearly all the sun loungers had been taken by hotel guests. There was a mix of couples and families with small children. Later on some groups on tour or a conference came down also. The weather was still warm and there was a nice breeze and we stayed there until around 5:00 pm and then returned to the room. It is is easy to go to the Ramada Plaza Menam Riverside if you have a car. 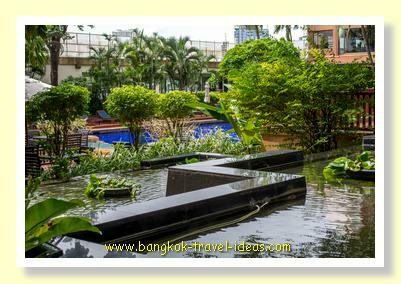 Just travel west down Rama IV Road and turn left just after Lumphini MRT station but before reaching Lumphini Park on the right hand side. 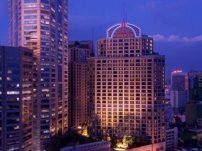 Continue down Sathorn Tai (South) Road and take a left at the end and follow Charoen Krung Road until you see the Ramada Plaza Menam on the right-hand side. If you go over the river then you have missed the left turn. 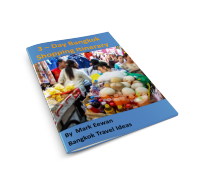 Even in if you don't have a car, you may take the BTS to the Saphan Taksin BTS station and then catch a taxi the last short distance. 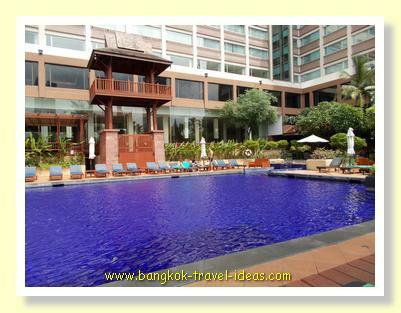 The Ramada Plaza Menam Riverside is located on the Chao Phraya River and is ideally situated for those who want to visit Bangkok Buddhist temples or just lounge around the pool. 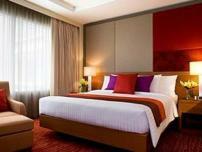 All rooms are extremely well appointed and the riverside pool makes a great place to just chill out and relax. 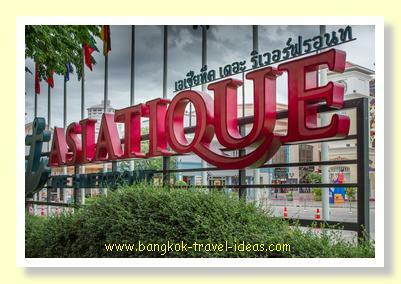 Just 500 metres away is Bangkok's newest shopping and relaxation destination; Asiatique the Riverfront welcomes overseas visitors from 5:00pm to late. Enjoy a late night dinner, catch a traditional Thai show or just catch up with friends and enjoy the sunset over the river.